This essay by D. L. Pughe first appeared in NEST Magazine. 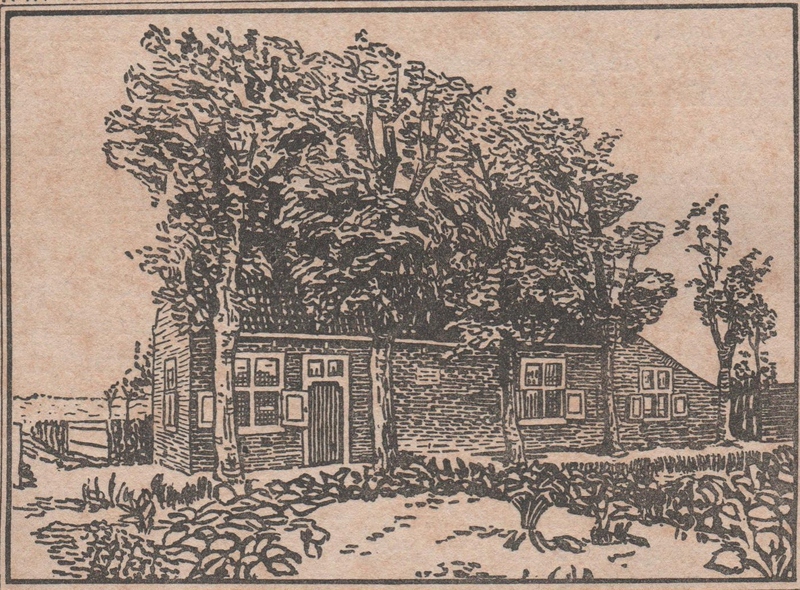 A few years ago I traveled to The Netherlands seeking out two of the homes of Spinoza which still remain. I wanted to see how he had lived, this man who offered the reassuring faith that philosophy could help with the problem of living. Arriving in Leiden, I found a small room in a hotel in the student quarter. It was named after an owl and had a window overlooking a cobblestone square where rare, end-of-winter sunlight was glancing off a statue of Erasmus. From above, his oxidized cheeks appeared green with sheets of tears. At the gates of the Horticultural Gardens of the University I met a friend who had come up from the Hague. We wandered through the groomed paths introducing ourselves to the Latinate shrubs and the fresh young shoots peering from the ground. He warned me he had a surprise and led me with eyes closed through several streets, into a building with a chill and smell of sanctuary. I felt high ceilings and ancient wooden floors. We climbed up wide stairs, then narrower stairs, then entered a room which I knew rose up into a dome. When I opened my eyes we were in the ancient dome of Mesdag’s panorama, painted over a century ago and offering views of Scheveningen, the coastal town not far from Rijnsberg where Spinoza lived. It was a chance to see the shore as he might have seen it, walking on the strand. After this, another surprise: an antiquarian library, a darkened private collection kept intact since it was founded by a nobleman in 1655. The curator led us to some low wooden cabinets and pulled out folios filled with the broadsheets printed in Spinoza’s day. These were pamphlets of all sizes handed out on the street, written by 17th century commentators on political events, on new ideas in physics, time, ethics. Suddenly, through these smudged sheets, the whole century sprang back alive: debates over Descartes’ method of doubt, announcements of Princess Elizabeth of Bohemia and other dignitaries arriving to find political sanctuary in the Netherlands, accounts of the daily challenges faced by the de Witt brothers in their efforts at reform. Spinoza at that time lived in the Hague with the house-painter Van der Spyck who rented him an attic room. I imagined his landlord arriving home from the town center with the latest papers, bringing them up to the attic to discuss them with his tenant. And outside his door, perhaps the Van der Spyck children tossing pillows, then beyond, out in the street the continual reckoning of lives. We were allowed to remain in this remarkable century for the rest of the afternoon, wearing white cotton gloves and turning brittle yellowed pages. That evening I walked through the narrow cobbled streets to look in the windows of the bookstores of Leiden. In one antiquarian shop an ancient wooden angel was holding a small vellum book in her upraised hands and wore a beatific smile, offering its knowledge to the street lamp opposite her. I was certain then that she moved, slightly turning her head. When I passed her again after dinner I had a feeling of deep satisfaction and anticipation. The glow of the street lamp had shifted or else she had gracefully moved her arms. Light was beaming across the pages of her uplifted book as though the lamp was now reading over her shoulder with deep and serious pleasure. After two I climbed under the sheets and fell asleep with a blurry vision of Spinoza’s correspondence of far and near: far is the great distance we witness in the celestial constellation of a dog; near the animal which barks. Just before dawn, a nightmare of flames leaping down the street woke me with a jolt. Then an image of abject 17th century cruelty flooded in, the day the de Witts were drawn and quartered in a public square. Spinoza had been horrified, he tried to carry a placard down to the crowds: Ultimi Barbarorum. He was stopped by his landlord, Van der Spyck, who knew all too well that Spinoza would also be instantly torn from limb to limb. I saw the floor was scattered with fallen cards, deep blue boxes in the early morning light. Rijnsburg is a small village near Leiden made up almost entirely of small stone houses on poorly marked streets. The train travels only so far and then it was a long walk, no crumbs along the path leading to Spinoza’s early home where he worked as a lens grinder. Finally, a small plaque attached to a cottage with a dark interior. Closed. I could see the glass grinding wheel sitting silently in one corner, a glass case of Spinoza’s library with their rubbed and worn spines in an adjacent room. The calm which lay in the interior was one I did not ever wish to disturb. As I walked away I recalled that Thoreau, like Spinoza, died at age 44. He developed an illness from the fine graphite dust inhaled while inventing his round pencil machine; for Spinoza it had been the powder of glass. His lenses had aided fellow explorers like the upholsterer van Leeuwenhoek in his discoveries of the creatures swimming in dregs of wine, and Huygens in his view out toward the stars. Yet what pulled Spinoza on was a desire for the invisible, the unseeable, for understanding. In The Hague Spinoza’s final home survives in what has become a rough section of the city; I was warned by the train conductor to leave before dark. The streets were broken in many places and lifeless, filled with a hollow silence. When I arrived I felt a sinking despair. The house was also dark and had a small brass notice explaining one must have an appointment in advance. I rang the bell and waited for the faint sound of footsteps. There were none. I realized it would be rude to ring again, so I stepped out into the street and gazed at the uppermost window of the attic. That was his room, the room where he composed the Ethics, the room where he wrote his ideas on freedom of speech, where he re-conceived the western view of God as a force of nature infusing all of life instead of a bearded man in the sky. And as I stood looking up a pair of eyes appeared between the curtains in a window on the lower floor. A few moments later the front door opened and a lovely older woman who was perhaps seventy invited me inside. The lower level holds the International Spinoza Society Library in dark brown wood. A long oak table easily conjures up images of meetings where earnest, erudite scholars engage in good-natured debates. My host, mevrouw van Oeffal, brought me a cup of hot tea and, much to my pleasure, one for herself and sat down to speak with me. She said she could tell from my expression that I had come a long way. She watched while I examined the manuscripts in glass cases and the sculpture of Spinoza in a dimly lit niche. Then I asked about the attic. No one goes up there, she explained. “No one?” I asked. She could tell how desperately I wanted to see it. Asking me not to tell, though not to whom, she led me through the second level where she and her husband live as caretakers. Their home held a lifetime of treasures: blue and white porcelain full of peaches set on a table covered with the traditional deep patterned carpet, delicate still life paintings in dark wooden frames. Mevrouw van Oeffal let me to a corner and pointed to a decorated wooden panel on the wall, pale blue with faded flowers. It was small, odd-shaped and warped and suddenly opened on an extremely narrow spiral brick and plaster stairwell. The steps curved up into the attic which, like most Dutch houses, is extremely long, stretching a distance away from the street. In Spinoza’s day, the house painter van der Spyck lived below with his wife. Their seven children slept in the back of the vast, dark attic—Spinoza’s room was in the front, with a thin wall separating him from their bright and noisy lives. Mevrouw van Oeffal opened the low door to his room, and in the dark I could see only bright squares from his window stretching a grid across the floor. Leaning closer, I expected to see his words etched in light, and then noticed her white hair glistening from the same sun. In one corner sat Spinoza’s small bed frame of dark wood slatted to hold a mattress; it had been given to him by his mother and was the only thing he kept from that legacy. [ii] The dark green curtains that once hung from its posts are gone, and other than its starkness without bedding it is striking only in its child-like size. In another corner, much to my surprise, mevrouw van Oeffal’s husband had set up an oak desk from this century with a few books on modern business subjects. She told me she and her husband became caretakers here seven years ago when he retired from Shell Oil. Her grip tightened. She knew from my expression that I had come to the same understanding by a different route and was as thankful. She told me how this knowledge affects the way she takes care of his home, how she imagines his life. Spinoza first spoke of conatus as a tendency for self-preservation which is common to all things in nature. Perhaps it is not simply a desire to exist but to arrive at an understanding of our existence. Perhaps, he reasoned, that is as close as we can come to salvation. Sed omnia præclara tam difficilia quàm rara ∫unt. This essay was first published in NEST Magazine, 2000. [ii] The poet Zbigniew Herbert tells the story of Spinoza’s bed in his book of essays about Dutch art and life: Still Life With A Bridle Trans. John and Bogdana Carpenter (London: Jonathan Cape, 1993) 150-152. [iii] Johannes Colerus, The Life of Benedict de Spinoza (The Hague: Martinus Nijhoff, 1906) 9. J. Thomas Cook discusses this biographical episode and its meaning in “Did Spinoza Lie to His Landlady?” in Studia Spinozana Vol. 11 (1995) Spinoza’s Philosophy of Religion (Würzburg: Königshausen u. Neumann GmH, 1996) 15-37.